My attempts to design a funky-colored vest have failed. While I think I got the colors right, 2 things derailed this project. 1.) lack of orange yarn. 2) the way the ribbing did not flow into the color work. It mad a really ugly rolled ridge. 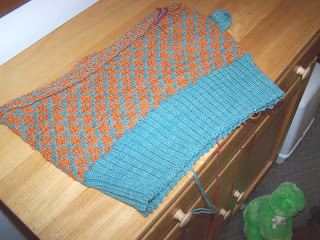 Perhaps I decreased too much between the rib and the colorwork. This is as far as I got before deciding to frog it (Ha - I just noticed the little stuffed frog in the picture, which was not planned). 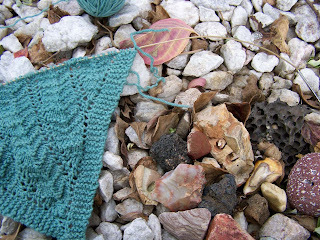 But with the frogging of an unsuccessful project comes the potential to start something new. Something that might allow the yarn to be used successfully. 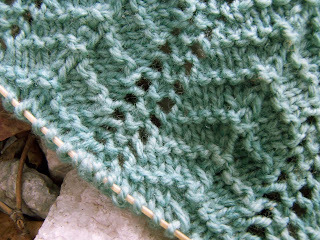 So using the blue yarn (and the color in the first photos below is more accurate), I started the Clementine Shawlette from the Spring 2007 Interweave Knits. So far so good. The pattern is easy to remember and enjoyable to knit. A close up picture with some of my rock collection. A super close-up of the stitch work. 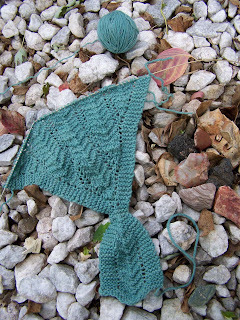 I could see this pattern working well with some variegated yarns.